1 Jesus spoke these things; and lifting up His eyes to heaven, He said, "Father, the hour has come; glorify Your Son, that the Son may glorify You, 2 even as You gave Him authority over all flesh, that to all whom You have given Him, He may give eternal life. 3 "This is eternal life, that they may know You, the only true God, and Jesus Christ whom You have sent. 4 "I glorified You on the earth, having accomplished the work which You have given Me to do. 5 "Now, Father, glorify Me together with Yourself, with the glory which I had with You before the world was. 6 "I have manifested Your name to the men whom You gave Me out of the world; they were Yours and You gave them to Me, and they have kept Your word. 7 "Now they have come to know that everything You have given Me is from You; 8 for the words which You gave Me I have given to them; and they received them and truly understood that I came forth from You, and they believed that You sent Me. 9 "I ask on their behalf; I do not ask on behalf of the world, but of those whom You have given Me; for they are Yours; 10 and all things that are Mine are Yours, and Yours are Mine; and I have been glorified in them. This is a part of what is called Jesus High priestly prayer. He is the true high priest, and the high priest in Israel was only a role model. The Lord was accurately when it came to this, - yes accurate!? – Our words become weak here. We cannot grasp God in His Holiness. But He Himself choosed the one who was going to carry this into the holy place. It was a chosen one. And He gave accurately instructions of how it all should take place. If anybody than the chosen one dared coming inn, he would face death. And if the high priest walked inn without following the instructions, he would also face death. We read about Aaron’s sons in Leviticus 10, who brought strange fire before the Lord and they all died. This is telling us that the high priest possessed what it took to be able to stand in the sight of the Lord. By this he was a role model. He was the chosen one who had the means of payment, not just for himself, but for the whole people. But you know, the Jew is as lawful from nature of as we are, so most of them only saw a religious ritual performed. And they thought that God was reconciled by this deed. But those who by the Holy Ghost, through the high priest’s role model, got Jesus revealed in their hearts, they were saved by what they saw. They saw Him, the Lamb, who was going to destroy the head of the snake, by the atonement of the entire world’s sin. Foe everybody else it was just another reminder of sins. There is no salvation in admission of sin, but only in the carrier of sins. The high priest was going to stand in the sight of God for the people. It was a covenant between God and the high priest. He was the people’s representative. He was the one who appeared on behalf of the people. And then we start to see wonderful pictures of Jesus. “He who walked instead of us!” Our representative who walked before us on behalf of us, and by a new and living way opened for us through the curtain, that is, his body. (Hebr.10:20). You may say that when Jesus walked into the holy of holies the doors remained open after Him. So that you can enter right in? Oh no, so that you can walk in in His name! That is a safer foundation, where you will always know God’s delight. Without your mind and heart aimed towards this name, you will always start looking after other reasons. Reasons that cannot last! But this name is a salvation name. But do not come as Aaron’s sons, with strange fire. Maybe your faith is not stronger, so that you will end up walking in trembling, but as you walk inn through this name, you will be saved. “Father, the hour has come.” (v.1). Jesus speaks of a certain hour. An hour He and His Father knew of in advance. Jesus alludes to an agreement between them. When you were little you experienced appointed days. A certain day that you would get something or something joyful was going to happen. This day was arranged. And then finally one morning you open up your eyes and the day has come. “Father, the hour has come.”It was a covenant between God and the high priest. He had to bring the blood of the atonement for the entire people’s sins. But where in the world would God find blood that would take away the sin of the people? Everything was spotty! The blood from ram’s and calves was therefore just a role model. Then we see the covenant between the Father and the Son. He who was from eternity on (v.5), He received a body. “Therefore He says when He steps into the world: Sacrifice and gifts you did not want, but you created a body for Me.” God wanted a perfect man, without sin, with a willing heart lived and acted in complete accordance with His will. I.e. fulfilled the law. It had to be one with a clean heart. This was Jesus’ work, to fulfill the law in our place. He was the only One! So, without Jesus lies an unfulfilled law leaning on your shoulders and God wants you to live up to it, and fulfill it in detail, if you want to pass before Him by it. Because it is not cancelled, like some people think, but fulfilled, by the only, alone, Jesus Christ! Therefore there is no salvation outside of Him. But in Him, there is in return a whole and full salvation. The law is fulfilled! “I glorified You on the earth, having accomplished the work which You have given Me to do.“(v.4). Listen you who are having a hard time satisfying God! The work which You have given Me to do.” Jesus – Not you! After accomplishing this work, He is standing in the sight of God as One who has the right to live, from what He is in Himself, He give then this right to us who has no right. He gives us His right to live, and has to Himself face the reward of a sinner, which is death. Do you see Jesus? Then Jesus says something – May God open our eyes so we can see! “Anyone who has seen me has seen the Father.” (John14:9). It is only as if a person has to be reluctant to take the word into his mouth, but it is still the truth – God died for me. 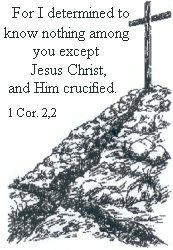 He died my death, for my sins, and His righteousness he has given me in Jesus. Think about it, God’s own righteousness! He wanted that we in faith and trust would come to Him running into this word, but you and me would rather go like the prodigal son and think about what we would say, how we can settle this, explain ourselves, prepare ourselves first etc. But from the Lord, we hear: “And everything is ready!” (Matthew 22:4). Everything! From eternity on it was a covenant between the Father and the Son. Now the hour had come, when it would happen. And Jesus speaks of it as a glorification of both the Father and the Son. What does the world see, when it sees Christ crucified? It backs off! But you, what do you see? Notice what Jesus says in this passage: “This is eternal life, that they may know You, the only true God, and Jesus Christ whom You have sent!” (v.3). “Anyone who rejected the law of Moses died without mercy on the testimony of two or three witnesses. How much more severely do you think a man deserves to be punished who has trampled the Son of God under foot, who has treated as an unholy thing the blood of the covenant that sanctified him, and who has insulted the Spirit of grace?” (Hebrew 10:28-29). What do you see in this? A terrible word which says – poor you if you do not believe in the Gospel, and in a right way? Oh yes, he who despises God’s Gospel, should look at it this way. But he who longs for faith and the certainty, you see how high God esteem His Gospel. Which speaks of your salvation in Jesus Christ! The firmer it speaks to us. Jesus says about His disciples that, they have kept Your word (v.6). They have received His word! How will I know if I am among those who have received His word? Yes, the Gospel (the word about Jesus) alone, brings me comfort and life. Everything else is judgement to me! There is a lot which is both good and necessary in various connections, but I cannot meet God with that! Only the word about Jesus can calm the heart, because you are enlightened of God! Where there is no Gospel, there is only law, with all the commandments and demands, but where the Gospel is, there is a fulfilled law. All commandments and demands are fulfilled! “I glorified You on the earth, having accomplished the work which You have given Me to do.”(v.4). When the Holy Ghost lights this up for us, we will see that the law and the Gospel is two completely different roads, which does not have anything to do with each other. There is the law’s way, - it is good, but I am not. It will not lead to the goal, because in all its goodness and holiness it only reveals my sin and impurity, and wakes it up to life. And I will see that as much as I want the good stuff, evil is right there with me (Rom.7:21). But where the Gospel way goes – without any commandments and demands, it cleanses me from all sin and impurity, gives me everything for nothing and it says: Jesus has gone before me! He has made the way, and from now on and till you have reached your destination, you can count on Him, and what He possesses, in your place!